Adelaide Members getting into the swing of the 35th National Show with the Iron Pony Event that Was Sponsored By Neal Solly as a Tribute to John Black. The Iron Pony is a six things to do with the pony and is a timed event.$50.00 is the prize and everyone has a good laugh and lots of fun. For people who have horses / ponies, there is a related hobby, which is extremely popular, especially during those times when either there are no shows or you cannot exercise your four-legged friend(s). I am referring to “model horses”. Some of you may already be familiar with the better known brands of Breyer and Peter Stone. A quick search on Google will reveal the sheer quantity of equine breeds available as plastic models from these large manufacturers. However, while simply collecting plastic models and letting them accumulate dust on shelves is popular, the far more interesting aspects are twofold. First, hobby enthusiasts purchase models from equine artists who have “customised” the model. That is, the artist has repainted the model (with acrylic or oil paints) to look like a real animal. It is not unusual for a hobbyist to find an artist (usually in the US) whom they pay to paint a model to look just like their favourite pony. If you look on eBay, there are some jaw-dropping prices for these “customised models”. In fact, it would be perfectly natural to think that you could buy a real pony for the same price as some of the models! Secondly, there is the world of “model horse performance”. This is a personal favourite. You actually put miniature tack and a rider on your model, and then take a photo (with a suitable background) of a set-up which replicates a real arena event. For example, in English that could be dressage or show jumping; in Western, it could be Western trail or cutting. Some aficionados also create miniature costumes: Native American, Arabian, etc. As you can imagine, creating tack and dressing up dolls (riders) specifically for model horses is a whole other hobby in itself. In the photo, Little Turtle is a Ponies of the Americas USA (but could, of course, be a Palouse Pony), which has been customised by Bette Thatcher, Narromine. The description is: “Walk and Jog Western Pleasure, 10 Years and Under: Judge walks up to Stevie in the lineup and asks him to rein back his pony”. I have entered it (for free) in the IMEHA (http://www.imeha.org/) online show series. I also show it in model horse photo shows that we have here in Australia through the Australasian and International Model Horse Club (AIMHC). Happy to provide more information to anyone who is interested in learning more. APPA & Members wish to send our deepest sympathies to Twin Acres Stud ( Annette Currie ) on the passing of her beloved Stallion Innisfree Montezuma at the ripe old age of 28 yrs old. We hope you run free with all those pretty palouse pony mares. Janelle Adam and her family attended the Warwick QLD Jumpers & Jazz Festival over the weekend with in tow Puzzle Pieces , a beautiful palouse pony gelding owned by Janelle's Son Scott. I read with great interest the article ‘In Our “Little Corner” ‘ in the last APPA magazine (Christmas issue, 2014), and decided to write to you tell you my own story of the origin of my stud and its connection to Wantsley Iago and the Wantsley Stud in the UK. We asked Jack about them and he told us that both were by this spotted stallion he owned that was imported from England. His name was IAGO. Both fillies were for sale. When I asked the prices, Jack said the spotted one was worth $2000 (I think, as it was a long time ago, but remember it was a LOT of money). The other little one, no spots but by IAGO, was only $200. So needless to say I bought that little bright bay filly whom I named ‘Twin Acres Lady’ and she became my 2nd mini mare in my very own new stud. I now know that the beautiful bright bay colour that she was, was inherited from IAGO’s Dam:- Holwell Imogen. Twin Acres Lady grew to be a lovely little mare (8.2hh). In 1984 I met Arnold and Gwen Scriven at the annual weanling auction my mother, Betty Myers (Pentland Shetland Pony Stud), held on her property in Ballarat, Victoria. Mum had mentioned to them my love of SPOTS, so they offered me a service to their spotted stallion, Little Navaho. Needless to say, I took them up on that offer and the mare I chose to take was Twin Acres Lady, and one of her daughters, Twin Acres Princess. I did get foals, but unfortunately, not the spotted variety I so desired. ‘Monty’, as I called him, bred me many foals down through the years, and yes, even some from Lady, my IAGO daughter, and her daughters. During those years, I discovered that his true name was WANSTLEY IAGO, and was bred at the Wanstley Stud in England. I even acquired a copy of his original papers. Some of Monty’s foals were spotted, some not. Some of the spotted ones were kept in the stud. Monty’s biggest fault (in my mind) was the size of the foals he sired. Even using mini mares, he did have a habit of producing foals that would grow over mini size of 8.2hh (87cm) GENETICS!! Then, in 1996, I travelled with my parents on a trip to England to look at some Shetland studs, see some shows, visit the ‘Miniature Pony Centre’ (in Devon) and even visit the Wantsley Stud. What a wonderful few weeks we had. The Miniature Pony Centre was a tourist attraction, but was owned by Jane Dennis, who had the Kerswell Stud. We did the tourist thing, then met Jane (my mum had met her on a previous trip) We then got to see the Kerswell Stud ponies in the paddocks over the road from the tourist attraction – Imagine my surprise when we found spotted mares, stallion and foals in amongst her pure bred Shetlands. Upon asking about them, we found out the spotted ponies were owned by Mrs Seymour of Wanstley Stud. Due to her ill health, Jane was helping her out and was continuing the breeding of Wanstley spotted ponies, but also mixing with some of the Kerswell Shetland ponies. The Wanstley stallion that Jane was using was Wanstley Camelot – a grandson of Wanstley Iago. I was very impressed by all we saw, both the pure bred Shetlands and the spotted ponies. All were lovely, well put together ponies. Could have brought MANY of them home with us!! (if only). It was a trip to remember. But my story doesn’t finish there….. 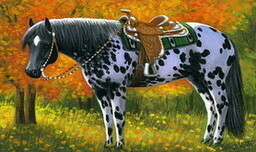 In February, 2006, I was offered the chance to purchase a mini spotted stallion - imported from England. He, and another, had been brought out to Australia by Ann Grice, who also loved spotted ponies. (not sure when this happened, but believe it was around 1997. She used both stallions over the next 8 years, but then died suddenly, and her ponies were all sold up by her family. One of the imported stallions went to Jan McCooey, and Ann’s sister claimed the other one. A friend of mine got in touch with me and said that Ann’s sister needed to find a home for this stallion. His name was Kerswell Spark. A red leopard and measured 8.1 hh. I looked at his pedigree and just couldn’t believe my luck. I bought him and registered him with the APPA and AMPS. Yes, back to the IAGO line again!! Needless to say Spark still lives here at Twin Acres and I am getting some wonderful foals, most of them coloured. I have kept a few of his coloured fillies, who are now producing coloured foals of their own. As he is now nearly 19 years old, I have also kept a coloured son of his, Twin Acres Sparkie Boy. He is smaller than his sire and stands just under 8hh. I have run him with his first group of mares (last spring) so am really looking forward to his foals in a few months time. Thank you for the Article you wrote In Our Little Corner. You have definitely inspired me to write a history of the spotted ponies in my stud and my involvement in the APPA. I hope APPA members out there have enjoyed reading it.